“The God of the Bible does not depend on his human creatures for his well-being (see Psa. 50:8-13; Acts 17:25), nor, now that we have sinned, is He bound to show us favor. Soundtrack Critique – Aubrey Hansen offers a stellar review of the electronica score for Tron: Legacy. Needless to say, I’ve added it to my “to-be-bought” music list. The Duties of Shepherds (Pt. 1) – A superb post from Michael Wright on 1 Peter 5:1-4. The Monkey-Driven Evolutionist – Reason #3,468 that I love Eddie Eddings and his blog. Some would consider the pairing of “Christian” with “Sci-Fi” to be a contradiction in terms. Like Aubrey Hansen’s Red Rain, this book proves them dead wrong. Randal Knox never wanted to be a leader, but as the eldest son of the Prime Minister of New Geneva, he appeared destined for the political arena. Averse to the idea, Randal enlists in the armored infantry, preferring a life in the military to being a political figure. When the Khlisti – followers of a religion cobbled together from Marxism, Islam, and New age spirituality – seize control of neighboring Abkhenazia, Randal’s world is turned completely upside down. An overwhelming army of zealots cross the border into New Geneva, scattering its small defense force and sending the survivors running for their lives. Randal pulls together a handful of armored infantry and takes shelter in the mountain city of Providence. But the respite is short-lived. With Providence under the control of Colonal Gregor Tsepashin, Randal Knox faces a choice between hiding safely in the catacombs… and leading his motley crew of fighters in guerilla warfare against the enemy. 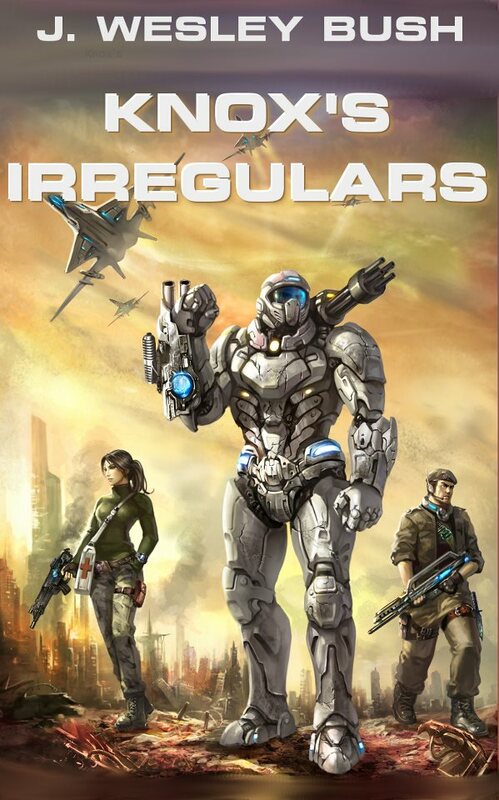 Thus is the premise behind J. Wesley Bush’s new novel Knox’s Irregulars – a futuristic military thriller set in the 25th century and laced with science fiction, first-rate adventure, wry humor, and memorable characters. Needless to say, I’m impressed. I can count on one hand the modern novels I’ve read that smoothly incorporate Christianity into the storyline. Most fail for one of two reasons: either the author hasn’t a clue about what he believes, or he doesn’t know how to communicate it without turning the book into an artistically-deficient soapbox. J. Wesley Bush avoids both these pitfalls. 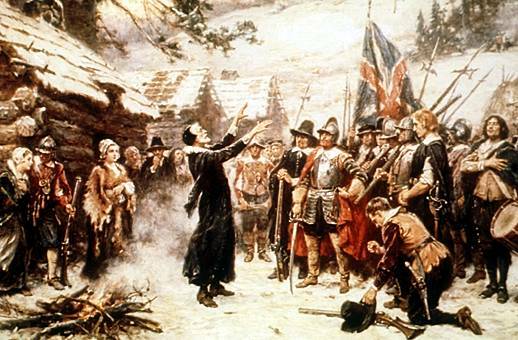 Christian themes and characters (and a staunch respect for the Calvinist principals of the Reformation) are abundant, but they’re woven in without force – thus lending the story substance without reducing it to platitudinous sermonizing. The characters – from Randal Knox to Arianne to the mad Belorussian immigrant Lebedev – are three-dimensional and wonderfully-imagined, developing naturally as the story progresses. No stale cardboard cutouts here, and thank goodness for that. Personally, I would’ve appreciated reading a little more about Colonel Tsepashin, but this is a minor complaint: the focus of the book is Knox and his irregulars, and in that regard, Bush’s character-crafting is more than satisfactory. Best of all is the quality of the writing: it’s smooth, polished, and consistently good throughout. The dialogue is realistic, the pacing is smart, and the sprinkling of wry humor is funny without ever jeopardizing the overall seriousness of the story. Also worth noting are the action sequences, which are crisply written and exciting. Bush’s attention to the technical details – he previously served as an airborne infantryman, military intelligence cryptolinguist, and NGO worker – make his fascinating vision of futuristic warfare all the more believable. For those wondering about content, there’s not much to be concerned about here. Of course, there’s quite a bit of war violence, as good guys and bad guys alike are annihilated by a plethora of futuristic armaments; and while these sequences are intense, they’re seldom gory. A smattering of mild language is present, and there is some (tasteful) discussion of an out-of-wedlock pregnancy. Sexuality is nil: the relationship between Randal and Arianne is a sweet one, and while they do share several kisses (which I would’ve preferred they save until marriage), their romance is overall as chaste and lovely a one as you could possibly hope for. I was initially troubled by the fact that the two primary female characters were serving side-by-side with men in the New Genevan military force. After some consideration, however, I wouldn’t say Bush is endorsing this sort of egalitarianism, but rather merely presenting it as a likely – if less than ideal – scenario. Judging by the state of our present military, I’m inclined to agree that he is (unfortunately) correct.